When the images of Lascaux Cave suddenly appear on front of the world, people praise that were the most unbelievable group of drawings we every know. Unlike any other old master pieces of art works have a long history of collection, have been through selections and preservation by generations of our societies. Although there is 15,000 year long distance from the past to now still Lascaux hits our mind with the universality of basic human ability, instant reaction and response to nature. Lascaux proved us: the basic intuitive ability of mankind is very similar regardless of time, culture, geographic location and human race. Our mind is only shaped by different ideology and the human's survive needs. Drawing is such old form of visual thinking process. A typical style of drawing might determine by an ideology and/or environmental situation. But the clarity of such determination could be made blurring if we, as artists or human being, exchange our ideas and drawing technics from different planet. Although such exchanges may not be comfortable or nature in time, but they will shorten the distance between us aesthetically, make aware the verity of the method of thinking technically. Any contempt and refuses of such exchange might originate by a conservative regionalism or a temporal local political needs. A visionary politician, artist and thinker are always willing to follow his or her intuitive decision, and to break the unknown. We could judge it but we don't resist it. The unthinkable might be the common sense nurtured by time. That had been proved in the history of art development over and over again. Inside-Out Art Museum always promotes all kinds of culture exchange. We believe all artistic forms should be openly sheared and discussed. 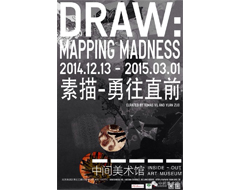 We are horned to have all of you to participate this first drawing survey exhibition in our museum. Our gratitude goes to LeRoy Neiman Foundation and The Inside-Out Art Fund at the Beijing Cultural Development Foundation. We are looking forward to carry on this dialogue amount all of us into the future.